Among the many comforts of the accommodations at Hilton President Kansas City are the Serenity® Bed by Hilton, a luxurious bath with renowned Peter Thomas Roth clinical skin and hair personal care amenities, HDTV content, and complimentary high-speed Internet access. Guestrooms - Vibrant and exceptionally well-appointed, these accommodations are available with one king-size or two double-size beds. 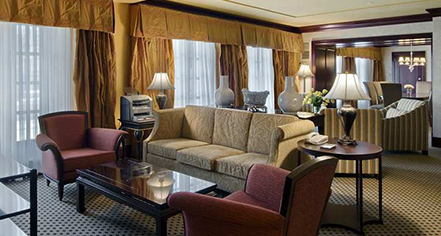 Suites - A variety of spacious junior and one bedroom suites are available for the discerning guest. 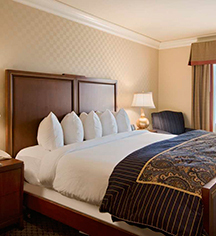 Accessible Rooms - Outfitted to ensure the comfort and safety of every guest, accessible guestrooms are furnished with assistive features in addition to all of the standard luxury amenities provided at Hilton President Kansas City.